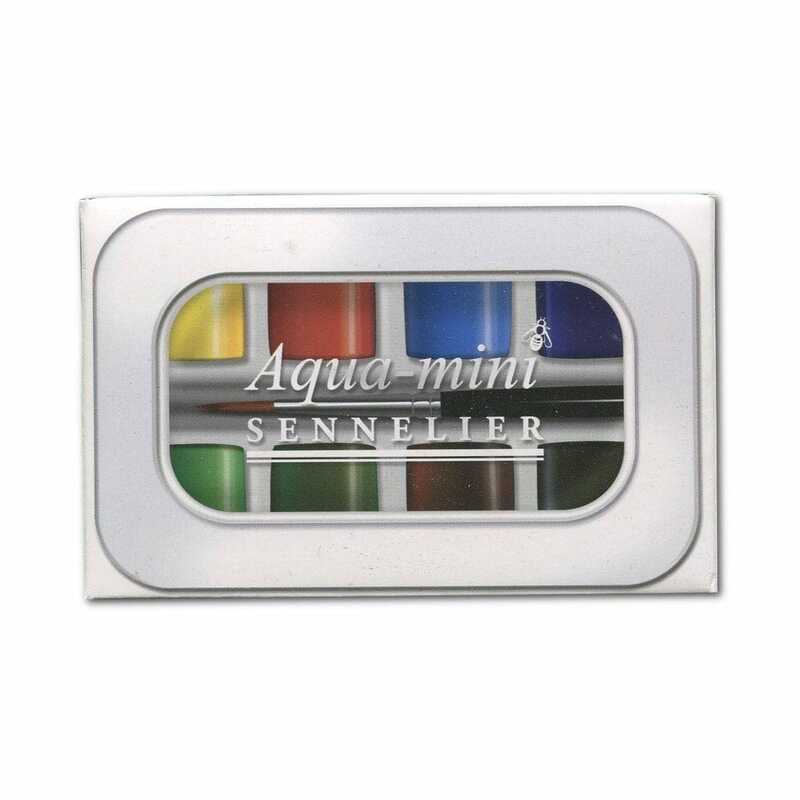 This Sennelier Watercolour Mini Set of 8 Half Pans is the perfect size for using watercolour on the move. The 8 half pans come in a white metal box with a transparent window so that you can easily view your colours . The set also includes a travel watercolour brush. L'Aquarelle Sennelier has been produced in the same way for more than a century using the best pigments and top quality Kordofan Gum Arabic as a bonding agent. This mix of natural ingredients produces colours which have a smooth, bright texture and offer lively, colourful shades. The Gum Arabic and honey combination offers incomparable quality of application, producing superb washes. Then, this base is mixed with pigments and carefully ground. Sennelier makes sure to wet the pigments in purified water (with no mineral salts) for 24 hours before mixing them in with the bonding agent. This improves the way in which the colours and bonding merge together, in turn bringing out the full beauty of the colours. The dimensions of the box measure 4 x 2.5 x 1 inches. A bit about the brand: Sennelier is a French brand of art supplies famous for their hand selected pigments. They produce oil paints, water colors, gouache, pastels, india ink and many other fine art products.